I found this dress while I was shopping on one of my off days at fashion week with my friend Sarah. We stopped in Owen, a small, well-curated boutique in the Meatpacking District. They carry cool and up-and-coming designers like ACNE, Clover Canyon, Ostwald Helgason, Tome, as well as some of my favorite established brands like Rag & Bone, Isabel Marant and Alexander Wang. If you saw my Instagram of the store, you’ll know that the design of the store itself is incredible. The entire ceiling is made up entirely of open brown paper bags! Neat, right? While perusing the racks, I stopped at this Wayne dress (unfortunately not available online). So simple, but with just the right touch of glamour with a peekaboo satin hem. The sheer sleeves and light feel of the dress make it a great transitional piece too. As you already know, I’m not very good at delayed gratification, so I wore it on my last day of shows! Another piece I’m craving by Wayne is this navy one-sleeve top. Super unique and very chic. To check out other Wayne pieces, head over to Owen and Barney’s New York! Love the sheer sleeves, adorable dress. Love the mix of textures here and that little Chanel bag is so pretty! Have a great weekend! Your earrings are gorgeous. Also, I love your take on all black with the gray Chanel bag. Exquisite as always, Merritt. That dress is fab! Love the all black look. NY boutiques are the best. everything about this outfit is gorgeous! i love the different textures in the wayne dress…the chanel flats are perfect…and that coat…no words!!!! Wow – who knew paper bags could be so chic?! That dress is absolutely adorable on you and I love it with flats! I went to Owen when I was in NYC and it was so cool! They have such a great mix of designers and the store was so neat! Wish we were walking down the Highline right now! Oh I love that bag in this color!!! Loveeee the look! I am all about neutrals! You look beautiful! Beautiful look but can’t keep our eyes off of that coat – love it! So chic!! Loving that dress. Great outfit, everything matches perfectly and you look adorably. 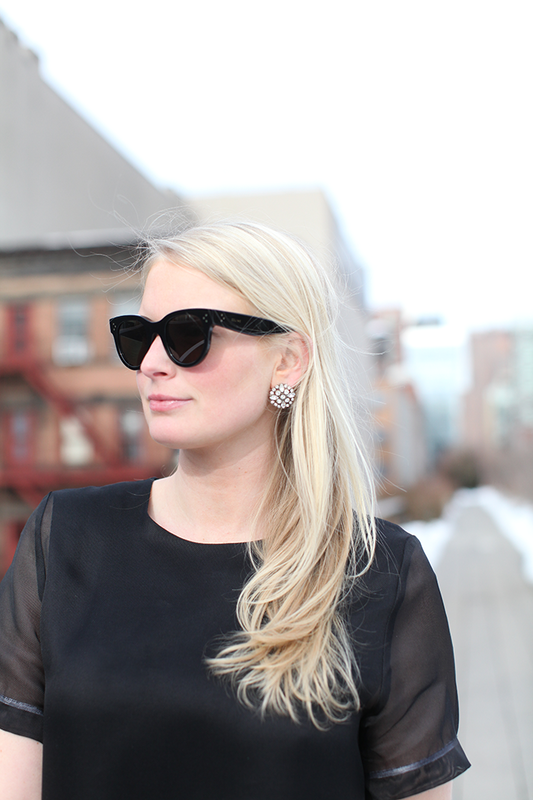 Such a cool twist on the classic LBD. And, I’ve been thinking up ways to use brown paper bags since I saw that pic on Instagram. Maybe next time that I host book club?